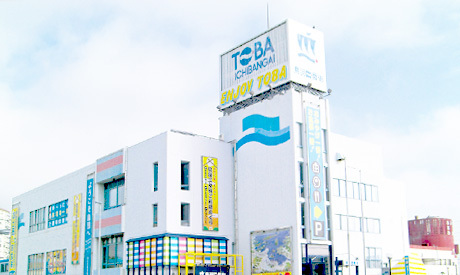 Toba1bangai is the largest shopping center in Toba city, which is located by JR and Kintetsu Toba station, Toba bus center, and the municipal parking lot (offering parking discount ticket for our customer). Inside the building you will find 28 specialized shops and restaurants offering souvenir, pearls and Toba’s authentic foods. There is also Ise-Shima Barrier-free Tourism Information Center residing. We offer our overseas customer duty-free discount. Besides, you will spend enjoyable time in Toba1bangai with visiting a deputy wishing registration station for Toba Sanmeshin including Ishigami-San, who grants women's wishes, looking across the sweep of Toba Bay at the observation room, tasting Isecha (authentic green tea in Ise) for free, or getting relaxed by the waterless footbath. We are looking forward to you visiting us for shopping, dining, or resting. *We can provide our visitors with tourism information in English. Credit card payment is accepted at all stores including pearl stores andn reataurants in Toba1bangai. Free Internet access available. Ask Toba1bantabi Concierge for accessing instruction. Guide dogs can go along with visitors inside the building. In case that we have to necessarily decline entering to restaurants because of health concern, a restaurant staff will let you know. Ise-Shima Barrier-free Tourism Information Center offers tourism information of Ise/Shima region and barrier-free facility information of neighboring accommodation to handicapped visitors and elderly people. No size limitation. 200 yen per baggage. *We do not accept 1.) overnight check-in, 2. )perishable items, 3.)valuables. Professional concierges introduce Ise/Shima's sightseeing spots. Restaurants in Toba1bangai offer various specialties with authentic foodstuffs from Ise/Shima's fresh seafood such as Ise ebi(Japanese Spiny Lobster) and abalones to Matsusaka Beef that Mie boasts to the world. You have choice among Japanese restaurant, Western restaurant, noodle restaurant, or café, so please enjoy Toba's specialties according to your taste. There are 6 pearl stores with professional knowledge and skill in Toba1bangai. You will find your gem among our abundant product lineup. We offer duty-free discount to our overseas visitors. We have a large assortment of premium gifts of Ise/Shima which represent Japanese culture, and being exclusive in this area and loved by local people. We offer duty-free discount to our overseas visitors. Toba1bantabi Concierge is our comprehensive information desk. Resident concierges will provide visitors with various services.